Lotus Workplace Web Content Management is a key component of the Lotus Workplace solution which helps you manage your corporate content from initial creation to final Web presentation. This content can exist in different forms and formats within your organization. With Lotus Workplace Web Content Management, your information can be freely distributed and instantly updated across all e-business applications, including Internet, intranet, and extranet Web sites. Lotus Workplace Web Content Management provides collaborative Web content design, approval, caching and staging services. This publishing service is available for Lotus Domino, WebSphere Portal and the IBM DB2 Content Manager. For customers using Domino, Lotus Workplace Web Content provides a compelling way to extend not only Domino applications and content to the Web but also to J2EE environments.These capabilities enable customers to use content integrated not only across key IBM middleware but also across business processes. 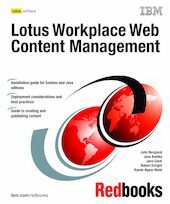 In this IBM Redbooks publication, we describe key concepts of content management while also providing an in depth look at the architecture and implementation for both the Domino edition and J2EE edition of Lotus Workplace Web Content Management. We begin by discussing best practices for deployment planning and describe how to install and configure the Lotus Workplace Web Content Management system, Next we discuss the importance of information architecture and site design, using a specific reference example site to illustrate concepts and demonstrate how to create and publish web content using Lotus Workplace Web Content Management . Finally, we address issues of integration within a portal environment, highlighting integration methods, best practices and considerations for presentation and navigation within a portal.